Kentucky's Democratic Gov. Steve Beshear breathlessly announced today that he has secured a deal with Ark Encounter LLC to build an awesome creationism-themed amusement park in his state. What, along with a "full-scale Noah's Ark," will it contain? The $150-million Ark Encounter park is expected to bring 900 jobs and $250 million in revenue to the state, according to a comical press release from the governor's office titled, "Governor Beshear, Ark Encounter Announce Plans to Build a Full-Scale Noah's Ark." While it's privately funded, those $37.5 million in tax breaks won't hurt either. 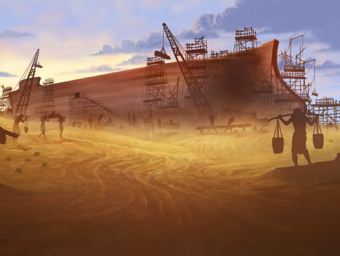 Aside from the full-scale Noah's Ark — and btw, how exactly did they determine the precise dimensions of this mythical ark? — the park will contain other remnants of the hallucinatory, impoverished desert hellscape that was early Judeo-Christian civilization. In addition to the full-size Ark, the complex will include a Walled City much like was found in ancient times, live animal shows, a children's interactive play area, a replica of the Tower of Babel with exhibits, a 500-seat 5-D special effects theater, an aviary, and a first-century Middle Eastern village. "5-D special effects" are when Jesus jumps out of the picture and pours scalding hot wine on you, for changing money in a temple. The parent company behind this project is also responsible for the Kentucky's Creation Museum, so now you can visit both in the same trip. The governor's office also notes, however, that many of the Ark Encounter's constructions are expected to be LEED-certified. Bad idea. Haven't these people never heard about the Green Dragon?